The president-elect has pledged to deport millions of undocumented immigrants, but his proposals would require the cooperation of state and local authorities. In an interview with 60 Minutes last month, President-elect Donald Trump made yet another pledge to remove undocumented immigrants from the United States, saying he would deport up to 3 million of them who “have criminal records.” Similar promises—like building a wall along the U.S.-Mexico border, and blocking federal funding to so-called sanctuary cities—were a cornerstone of his campaign. But as he assumes the presidency, Trump will face not only continued public opposition to his plans, but potential obstruction by state and local law enforcement who he would need to implement any new policies. But the collaboration between different levels of law enforcement has hit roadblocks in the past. Take the Secure Communities program, which originated in the George W. Bush administration. Under the program, local authorities shared digital fingerprints of people booked in jail with the feds, who could then screen a national database to see if any matched with individuals suspected of immigration violations. Over time, however, the program appeared to drive a wedge between local authorities and the communities they served. The Obama administration ended it in 2014, citing backlash from governors, mayors, and state and local enforcement officials. When it comes to his promised immigration policies, the president-elect has already faced backlash of his own. 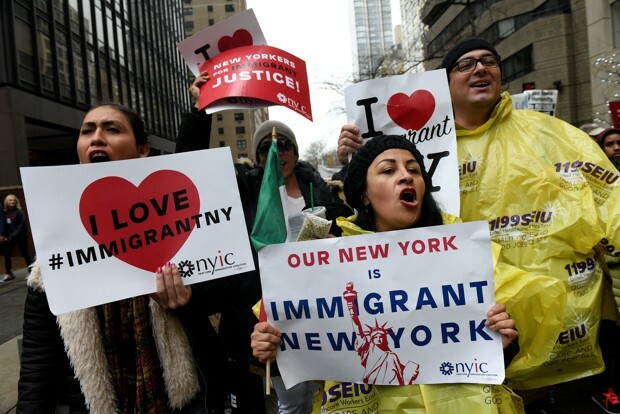 From the public, but also from mayors and governors—like Chicago Mayor Rahm Emanuel, Los Angeles Mayor Eric Garcetti, and Connecticut Governor Dannel Malloy—who’ve pledged to limit cooperation with federal immigration agents during the Trump presidency. I spoke with Su to get a sense of how state and local governments might process the president-elect’s proposals. Our conversation has been condensed and edited for clarity. Donald Trump has pledged to deport millions of undocumented immigrants. What does this proposal mean for state and local governments? If we are going to be talking about the kind of numbers that President Trump is interested in, he will need, in some ways, some degree of participation—unless he wants to greatly expand federal enforcement agencies. He would need state and local participation in order to accentuate the numbers that he wants. But because of their involvement, states and localities have also been developing their own interests and policies on immigration. What’s an example of the effect that federal immigration policies have on state and local law enforcement? At first, I think, it was considered to be very innocuous, very in-the-background. I think what ended up happening is, as you had more and more accounts that during any encounter with police departments—whether as a victim, as a witness, or maybe as a perpetrator or a suspect—they would screen you automatically for immigration status, you started having a lot of local police departments, local police chiefs express concerns that that was making it more difficult for them to reach out to the communities that they want to help and protect. Just as federal immigration enforcement now is reliant on local police departments, local police departments have also realized that they are also incredibly reliant on the communities themselves that help them with policing efforts. If you don’t have the cooperation of the community, that itself becomes a problem. You can’t entirely do it from a top-down enforcement perspective. I think that’s when you started seeing a lot of people—and a lot of communities—rebel against the development of Secure Communities. And eventually President Obama scrapped it, even though it was originally imagined as something that was much less visible, and much less intrusive than what previous administrations had done. But as a result, it made local communities much more attuned to the kind of relationships they have with the federal government. There have been a number of mayors and governors who have voiced their opposition to Trump’s immigration proposals. Is that an example of the type of resistance Trump may face? These are policies and positions [opposing some federal immigration measures] that mayors have actually been taking already with less visibility for a long time. So, in some ways, they’re reasserting or reaffirming their position in light of different circumstances and maybe with more urgency. In the end, Trump’s deportation proposals—and their execution—come back to which individuals he’ll mark first for removal. In 2014, the Department of Homeland Security said that they were prioritizing people who were threats to national security and public safety. My impression is that the reason why the priorities at the federal level change was in large part because they started having and opening up a dialogue and communication with the local communities that would be affected by this. As a result, what I saw [over time] in a lot of the shifting of federal priorities was actually a reflection of what the federal government was hearing from state and local officials. That, in some ways, was really interesting, because you had a system in which the federal government wanted, for their own interest, to convince state and local officials to cooperate. But as a result, state and local officials were able to give a broader perspective to the need and consequences of local immigration enforcement to the federal government. In some ways, the Trump administration coming in is not only an immigration question. There’s a bigger picture: How dedicated are they to centralize Washington control? And how committed are they to listening to what’s happening in mainstream America?